Sep 28 So What Now? As competition improves, Purdue seems to regress back to their offensively-inept ways from last year. The warning signs have been there, of course. Only winning by single-digits over Western Michigan, being manhandled by Central (seriously, they lost by three touchdowns at home to a really marginal MAC team), being a complete no show in the second half of three consecutive games. Even against SIU, how comfortable would that win have been if not for Purdue getting great field position a couple times early? It’s good to see that the defense is improving. That much can be said. It’s hard to lay the Iowa loss at their feet, though I was pleased to see the postgame comments from the defense were of the flavor of “well, we need to be even better and pick up the offense.” The problem, of course, is that they may need to actually do the scoring, though I don’t think that’s what they meant. What does Darrell Hazell do from here? Next Saturday is one of the winnable games remaining on the schedule, at Illinois. If Purdue lays another egg there, this thing will come apart fast, as MSU, Wisconsin and others loom on the horizon and will put a hurting on this team. The stadium will be even more empty, the players will begin to be lost (no matter how committed they seem right now) and the fans will grow even angrier. The good news is that Charilie Weis is now available to takeover play-calling duties from John Shoop. Alright, I was just seeing if you were paying attention. performance we just saw out of this offense. Has there been improvement from 2013 to 2014? Isn’t that what we asked for at the start of the season? Didn’t most of us expect another non-bowl season and maybe 3-5 wins at best? I think the answers to all of those are yes. So why do we all find ourselves in this complete funk where – and I think I speak for many of us – we don’t even want to watch anymore? It’s simply not fun, I think that’s what it is. And the easy answer, of course, is that when there is no hope of the offense scoring, well, that sort of takes some of the fun out of football. If the Western Michigan version of Purdue was out there 75% of the time (I can even accept one stinker quarter per game, which I think is pretty damn conciliatory), I think we’d all be having at least some measure of fun. The first half against Notre Dame wasn’t something explosive or spectacular, but the offense moved the ball, Shoop and company seemed to play to the personnel’s strengths (imagine that! ), and the defense was opportunistic and avoided big mistakes. That doesn’t sound like that difficult of a formula to follow, quite frankly. So what do you do? How do you show the players, fans, alums, etc., that there is some reason for hope? Some reason for optimism as we once again begin looking to “next year” in September? What will it take? I think if Purdue wins three Big Ten games, that would be a good start. Win a couple of the winnable games left on the schedule and maybe one you “shouldn’t” win. Or take down Illinois, Northwestern and IU and have fans thinking, well, at least we can compete again with the bottom of the conference. Because that’s where we’re at right now, folks. Purdue can’t even hope to compete with the bottom of the barrel. For those of you who were looking ahead and counting those three as likely wins, well, Northwestern just won handily at Penn State, IU won at Missouri last week and Illinois….well, at least Illinois pounded away at the patsies on their schedule. People can say what they want about the Big Ten, but it’s a major conference and there are no gimmes – especially if you’re Purdue. My anger at their performance yesterday had me harkening back to what I proposed when Danny Hope was still here – something he would never do. Go in there and make it really clear that this is not acceptable. Tell them no more special uniforms, no more alternate helmets… I’d even go so far as to tell them they get to wear their basic practice unis until they show improvement – that they need to earn back the “P” on the helmet. Don’t be measured and say we need to look at tape. 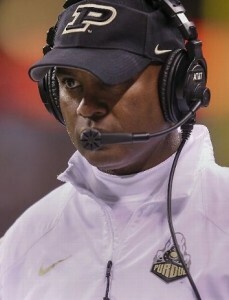 Hey, I mean, I like Darrell Hazell a lot, but no, Darrell, you don’t need to look at the tape of that tire fire from yesterday to know your offense sucked in all aspects. It’s time to mix things up. Staying the course is what you do when you’re close to something… when winning consistently is a few breaks away. When you just need to execute the game plan a little better. Purdue is not near being good – and they’re not looking like it’s beginning to come together. There are flashes where you have moments of hope, but that’s not enough. Sports are often about being consistently good – or at least just consistent at all. You don’t even have to be really good, but if you do something consistently, that can take you somewhere in college football. Just look at Coach Hazell’s 2012 Kent State team. They weren’t even that good, but they took care of the football, played opportunistically and ran the ball well. Mixing things up may mean giving Austin Appleby a start. What’s the worst that can happen? Could he be any worse than Danny Etling was yesterday? Give him a shot against another mediocre team and give him a whole game – maybe a couple whole games. Give him a more than fair audition and then, when the dust settles, you’ll have a decent body of work from both guys on which to judge them as they head towards 2015. And how about letting Raheem Mostert out of the doghouse? I know his yards per carry has plummeted since the opening game when he scored his only TD of the season and I know he fumbled and has been kicked away from… but he also could match Purdue’s total yards from yesterday in two plays. He’s that fast. And when offensive production is on short supply, I would think scouring the bench for guys who might produce isn’t a terrible idea. Maybe there is more to Mostert’s reduced playing time. And maybe it’s time to listen to the shouts about John Shoop. Because either he doesn’t have the offense doing what they need to do or there simply isn’t enough talent on this team to win more than a couple of games per season. I can’t believe the latter is the case. After the road game at the Illini this weekend, Purdue has a stretch of vs MSU, @ Minnesota, @ Nebraska and vs Wisconsin. The ship needs to be righted this weekend and Purdue needs to mix in an upset in one of those games or senior day on Nov 22 against Northwestern will be in front of 15,000 people and the apathy will make the current state of fan engagement look positively merry. Oct 1 Is Saturday a Must-Win?